Category Archives: What Should Candidates Wear? Formality is about seriousness, so that should be considered in any position one is applying for. √ Other: For women it’s fine. For men, not. √ Other: Makes no difference. √ Other: They should do whatever they’re comfortable with to make sure they’re confident and prepared. Anything too revealing or distracting that would call attention away from the substance of the interview, or that would indicate to the potential employer that the candidate is not serious – even if they did not intend to convey this. I got my job by nailing the interview in a suit on a 100 degree day in New Orleans when my interviewers were all in shorts and shirtsleeves. When I got there they told me that they had not expected that I would dress so formally, but I could tell that they knew I was serious and I feel like in some ways it gave me an edge in the interview. Things went very well and I was offered the job two days later. √ Other: Formality is about seriousness, so that should be considered in any position one is applying for. √ Other: Any of these are acceptable to me, but maybe not to other people. √ Other: Tasteful and appropriate, but not devoid of personality. It is secondary to their qualifications and ability to sell themselves for the position. 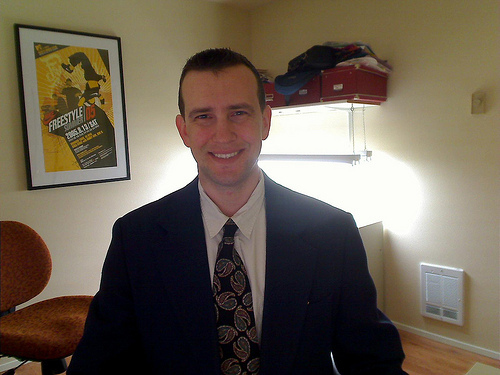 As I would dress in the workplace – business casual to business formal. √ Other: Business casual most days, business formal some days, and casual on Fridays. Photo: A job interview by Flickr user Pulpolux !!! Filed under Archives, Northeastern US, Rural area, What Should Candidates Wear? Multiple face piercings should be left at home. Small discrete are allowable. We have a strict dress code and I would like to see the candidate fit in from the first interview. 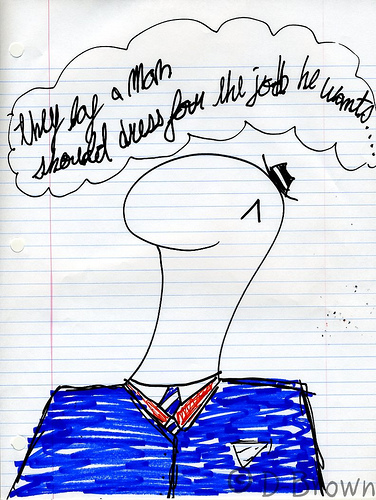 Filed under 0-10 staff members, Canada, City/town, Special, What Should Candidates Wear? This anonymous interview is with a Public librarian who has been a hiring manager and a member of a hiring or search committee. This librarian works at a library with 100-200 staff members in an Urban area in the Southern US. √ Other: Seriously outfit dependent, but as a rule would not be a wise idea. √ Other: Outfit dependent, but candidates should also learn about the dress code of the organization and lean to the way it expects employees to dress. As long as the candidate’s attire is reasonable, what someone chooses to wear doesn’t impact our hiring decisions all that much. Archivists tend to deal with materials that can be dirty or deteriorating that can irreparably harm clothing. While candidates shouldn’t come in ripped jeans and t-shirts, some understanding that they may be exposed to a dirty environment shows an understanding of the profession. Slightly nicer than the business casual dress code that is typical of our institution. Usually a skirt and nicer blouse, but flats rather than heels. Filed under 100-200 staff members, Public, Southern US, Urban area, What Should Candidates Wear? This anonymous interview is with Special librarian who has been a hiring manager and a member of a hiring or search committee. This librarian works at a library with 0-10 staff members in an Urban area in the Midwestern US. 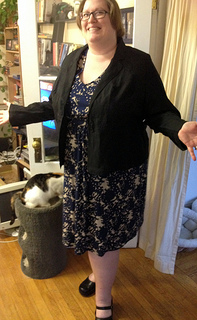 √ Other: It is okay to wear something else other than a suit as long as it looks dressy and/or professional. A guy should always wear a suit–no shorts and always a tie. Anything that can be construed as provocative…too short, too tight, to low, too showy, etc. It can be the difference particularly in a close race. If there are two candidates who have great personalities and experience and credentials I would be more apt to pick the one who took the time and effort to dress up than one who dressed down. It shows to me that the person is truly interested in the job and can bend a little to dress up for something important. I have always worn either a suit or a professional type dress with stockings and pumps. Filed under 0-10 staff members, Midwestern US, Special, Urban area, What Should Candidates Wear? This anonymous interview is with someone who, when asked “are you a librarian?” chose the “It’s complicated” response. This person has been a hiring manager and a member of a hiring or search committee. This person works at a semi-private museum library and archives with 0-10 staff members in a Suburban area in the mid-Atlantic. Clothing that poses a physical hazard to the work performed, torn or dirty clothing, clothing that is highly sexual, too tight or too revealing, or clothing that is advertising a brand or a political position. Interviewees should dress for the position they are seeking. If that job involves dirty, back-breaking labor, then I wouldn’t expect female candidates to show up in dresses any more than I would male candidates to show up in 3-piece suits. Personally, I judge candidates based on their knowledge, skills, experiences, and their passion for the work, not on their personal appearance. Some individuals dress according to their religion, some might dress to reflect an artistic personality, while others will dress according to their income. If we are truly going to encourage a diverse, non-discriminatory workplace, then we have to make allowances for personal expression with dress, including for hairstyles, make-up, accessories or garb that may be out of the norm, especially if the dress code is listed as “casual”. 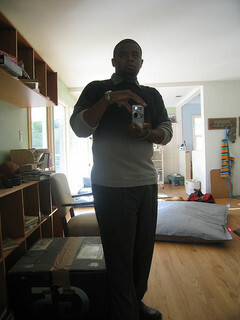 Neutral colors, usually all black, dress shirt and slacks, with a nice shoe. I have a nose ring, an eyebrow ring, gauged ears and tattoos in visible places, which I do not hide during the interview. I’ve learned the hard way that if someone is going to judge me based on my appearance, rather than on my work experience, talents, passions, and performance, then I’d rather not work for those kinds of people/ organizations anyway. The questions seem more geared toward what women and alternative-type people would wear. Is there the same concern over someone showing up to an interview wearing the traditional garb of a hasidic jew, the headdress of a hindi sikh, the muslim woman’s hijab, a male’s sarong, dhoti, chola, caftan, kanga or lungi skirt, the traditional facial piercings still found in India, Persia and Thailand, the traditional ritual facial scarification patterns or tooth modifications of sub-Saharan African cultures, or the traditional tribal face tattoos of Polynesian islanders, as there is towards westerners with tattoos, body piercings, unusual hair styles or dress? If not, our attitudes about dress and appearance are very likely discriminatory. Filed under 0-10 staff members, Archives, Special, Suburban area, What Should Candidates Wear? It is part of the overall package. If you dress a bit sloppily and then don’t appear to be very well organized during the interview, it confirms the initial impression of the clothes. Candidates who make an effort to dress well and have a neat appearance are serious about the job and appear to respect the process. I wear business casual – blouse and slacks or a skirt. √ Other: we do not have a dress code. √ Other: no dress code, but one policy requires a neat appearance. √ Other: none of the above. Filed under 10-50 staff members, City/town, Midwestern US, Public, What Should Candidates Wear? Tidy is important, fashion is not critical. Outward appearance, and the care taken with it, offers a hint at a candidates personality – and it should. It would be weird to interview Ms. Taupe and have hired Ms. plaid thigh highs and mini skirt. People should be themselves as much as possible. An interview is a chance for a candidate and an employer to size each other up – it isn’t a one way review. An ‘interview suit’ should also be something that is occasionally worn to work. Filed under Academic, Canada, Special, Urban area, What Should Candidates Wear?